However, some new technologies and research under way point the way to positive change and attention to the critical issues that matter in today’s world. Those who hold the keys to important work in the geospatial field charge forward, undaunted, into the New Year with their dedication and focus. Upon hearing in the news that climate change scientists and those who attended the Paris Accord were going to be expected to turn over their data, scientists who study climate change set to systematically saving their files on alternative servers to avoid the possibility of losing valuable data that has taken many years to accumulate and is vital to the health of our planet. This never happened: apparently, the powers-that-are-soon-to-be recognized their folly or this request was “unauthorized” as they say, and the scientists were off the hook. For now. “An enormous rift in one of Antarctica’s largest ice shelves grew dramatically over the past month, and a chunk nearly the size of Delaware could break away as soon as later this winter, British scientists reported this week.” The crack in the shelf is named Larsen C.
This event could cause the ice shelf to break up even more, which would then remove that raft of ice that blocks some of the glaciers from flowing into the ocean Scientists say this event could raise global sea levels by 10 centimeters, or nearly four inches. Major ice loss has occurred before in the Antarctic Peninsula as two other shelves have broken up in the past. 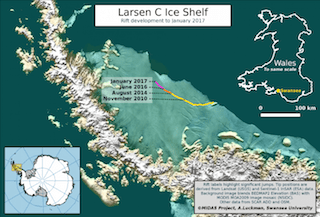 “When it calves, the Larsen C Ice Shelf will lose more than 10% of its area to leave the ice front at its most retreated position ever recorded; this event will fundamentally change the landscape of the Antarctic Peninsula,” said the researchers. Some industry watchers are concerned about what will happen with NASA’s Earth Science division, that received $1.921 billion for its Earth Science research for fiscal year 2016, up from $1.5 billion in 2009 under the Obama administration. It is unknown what the budget will be for this division under the coming administration. 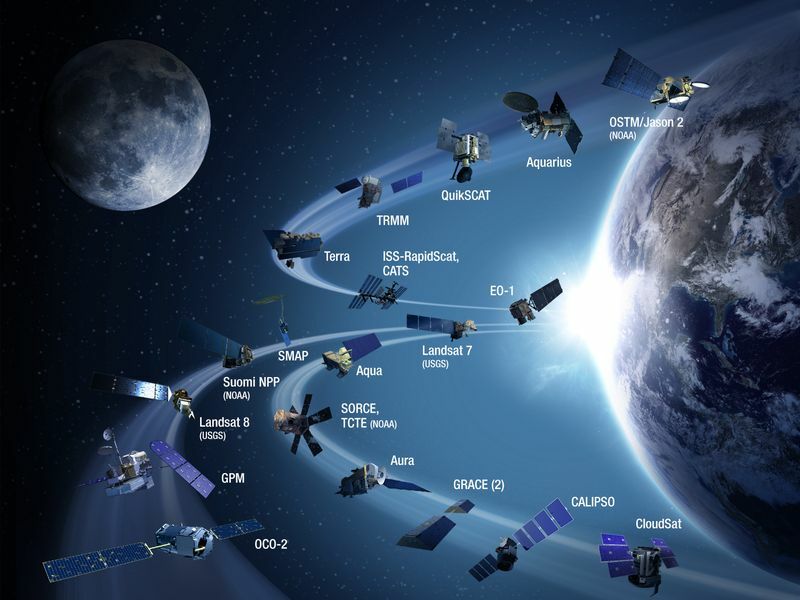 Earth observation satellites from NASA have gathered vital data about the Earth’s space, weather, sea level changes and climate over the past 8 years. 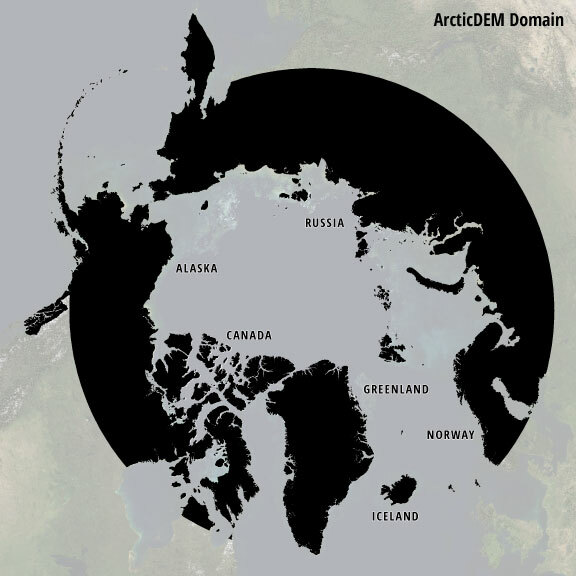 In a conversation with Peter Becker of Esri, he spoke about the revisions to the ArcticDEM Initiative, the first release of which was in January 2016, and the second release occurred currently. From the University of Minnesota, Polar Geospatial Center, comes this overview of the project: “ArcticDEM is an NGA-NSF public-private initiative to automatically produce a high-resolution, high quality, digital surface model (DSM) of the Arctic using optical stereo imagery, high-performance computing, and open source photogrammetry software. The ArcticDEM project is a response to the need for high quality elevation data in remote locations, the availability of technology to process big data, and the need for accurate measurement of topographic change. The producers did not intend for the final product as a single “eyes on” or edited product, but rather a collection of time-dependent elevation models and the infrastructure to process the flow of imagery from an ever-expanding constellation of satellites producing an ever-increasing volume of high-quality data. Sponsored by the NGA, the ArcticDEM makes use of super computers, cloud infrastructure, and ArcGIS to consume data directly in any way. All data is put in the Amazon Cloud, and can be accessed on any mobile device. WorldView satellites collect stereoscopic, highly accurate data, and can match images together. 60,000 strips of satellite imagery are created for 10,000s of covered scenes multiple times to monitor glaciers. WorldView is in a sun synchronous orbit that orbits 9-10 times daily. They are optical satellites dependent upon seeing the ground. In application, combined with Landsat scenes made accessible in the same way, users can see the latest DTMs and temporal Landsat imagery from 2 ½ years ago and make a comparison. One can also use a time tool to zoom to an area to see how the glacier has changed. Users can create applications from data and pull screens off the data. On another note, the 2017 Consumer Electronics Show (CES) in Las Vegas attracted over 165,000 people this month. As lead of the BlueLabs healthcare & public sector practice, he has transformed government agencies and large healthcare organizations to take a data-driven evidence-based approach to engaging with their constituents, where the experience is streamlined and everyone receives the information that is proven to help them take the next step. Before co-founding BlueLabs, Dyskant lead the geospatial analytics team at Obama’s 2012 re-election campaign, where he developed the geospatial algorithms necessary to make 25 million effective, relevant, voter contacts in 4 days. As has been pointed out at other events, the success of self-driving vehicles is reliant on teaching the cars how to be drivers, which means they will need to be personalized and connected. Artificial intelligence and wireless communications that enable in-car, personal experiences were showcased, as well as how cars may be able to talk to other cars, and how cars monitor what’s going on in their surroundings for improved safety on the road. Esri participated at CES as part of Microsoft’s connected car showcase. Frits van der Schaff, Head of Automotive, Esri and staff talked about mapping and spatial analytics that provides spatial geospatial context to foster safety and improve the overall driver experience. Microsoft staff showcased future scenarios where artificial intelligence bots can aid in improving driver safety, engagement, and integration with calendars and personal preferences. The Chinese company Taihuoniao, provider of technology products and global sales, provides a platform for design and internet startups to use for domestic as well as international markets, for developing crowdfunding efforts and sales and marketing. Company spokesmen were concerned about the portentous American president-elect’s focus on “bringing back manufacturing” that they feel may affect technology stocks negatively. 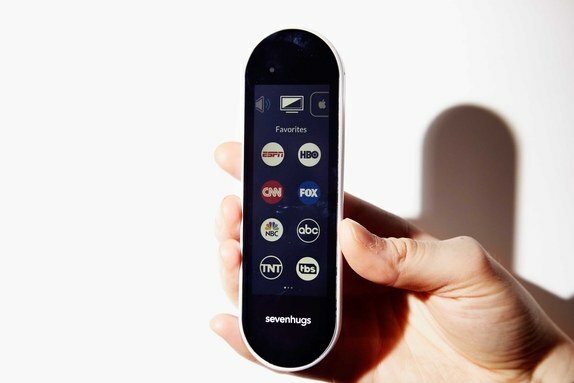 Indoor positioning showed up at CES this year in the body of the Sevenhugs Smart Remote, that connects to a proprietary indoor positioning system that triangulates its location and other connected devices it is aimed at. 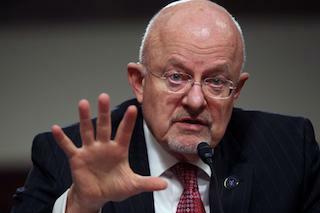 So, that it could be aimed at a TV and may bring up an app like streaming video. Embodied with contextual awareness, this Smart Remote could interface with over 25,000 connected devices in your home. The robust sense of innovation that is already in place shows great promise for the future, as science and technology move forward as a formidable force to be reckoned with. The importance and relevance of geospatial technology in the areas of intelligence, indoor positioning, global warming and climate change, research and development, self-driving vehicles and much more, as always, cannot be underestimated. Just in time for Thanksgiving: Metro Wine Map from UC Santa Barbara Geography Dept. This entry was posted on Tuesday, January 10th, 2017 at 9:28 am. You can follow any responses to this entry through the RSS 2.0 feed. You can leave a response, or trackback from your own site.